Surrey director of cricket Alec Stewart is targeting even higher standards this season as his side look to retain their Specsavers County Championship title. 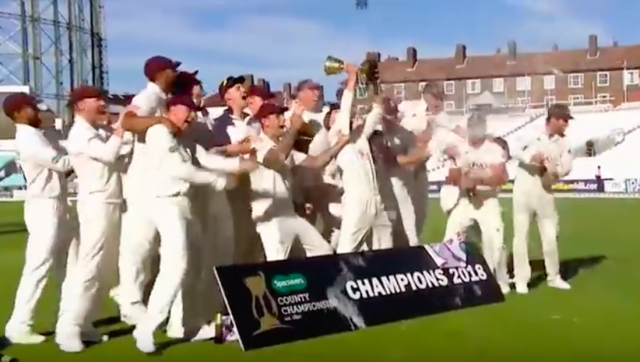 The county dominated red-ball cricket last year with ten victories and only one defeat — to Essex, in the season’s final match — as the Championship trophy returned to The Oval for the first time since 2002. But Essex are armed with Alastair Cook’s runs while Nottinghamshire, as well as signing four England starlets at the end of last season, have brought back James Pattinson and have Stuart Broad available until mid-July. Both sides are sure to be threats to Surrey’s defence. “The term I’ve used previously: we’ve been the hunters, we’re now the hunted,” Stewart said at the club’s annual media day. “Everyone will be trying to catch us up and, therefore through hard work and trying to improve, we want to try and keep that gap. Surrey relied heavily on their development system in winning the Championship. Several squad members have come through the youth set-up and many — including the likes of Ollie Pope, Sam Curran, Amar Virdi and Ryan Patel — played together at age group level. The progress at an individual level made under Michael Di Venuto, the head coach, since his appointment in 2016 has been staggering. Six of England’s last 11 Test debutants have been Surrey players — only Mark Stoneman and Ben Foakes did not come through the academy. “I think we’ve got some excellent senior players, some excellent role models,” Di Venuto explained. “My thing is that every time you turn up and walk through those gates, you’re here to improve and you’re here to get better, and those senior players are no different. “The youngsters come in there full of confidence and they’re just showing what they can do. There haven’t been too many ups and downs for them at the moment. One of those downs came for Foakes during the winter. An unused member of England’s Ashes drubbing last year, he made a century on Test debut in Sri Lanka in November, becoming only the second English wicketkeeper to do so. He was later named player of the series. But he was dropped ahead of the third and final Test in the Caribbean, with the selectors favouring a recall for Keaton Jennings and moving Joe Denly to three to move Jonny Bairstow back to seven. Stewart has previously described Foakes as the best wicketkeeper in the world, a claim he continues to boast, but the former England gloveman is insistent that Foakes is good enough to play Test cricket as a specialist batsman. “All we’ve said to him is if Bairstow has a loss of form or is injured, ‘make sure [you are] the next person in but if there’s batting slots up for grabs, make sure you’re also in the mix for that.’ He could easily have batted three in that last Test match. “Most people are sympathetic towards Foakes because he did nothing wrong, but Bairstow is worth his place in the side and he’s shown that for a number of years now. It just seemed a strange decision. “All I’ve said to him is he’s good enough to play as a batsman as well. Don’t worry about that. We’ve seen that, so don’t just think about him as the best keeper in the world. On the domestic front, Surrey are well-placed. They are the second most successful Championship club historically and have a very good chance of going through a dominant period. Only in 1914 and 1971 did one of their Championship titles stand alone, retaining it ten times in three different eras. The white-ball competitions have been something of a struggle since the club won the CB40 title in 2011. They have been runners-up in the Royal London One-Day Cup three times and have made Finals Day only twice. But with such enviable depth in their squad, Surrey are expecting to compete on all fronts.